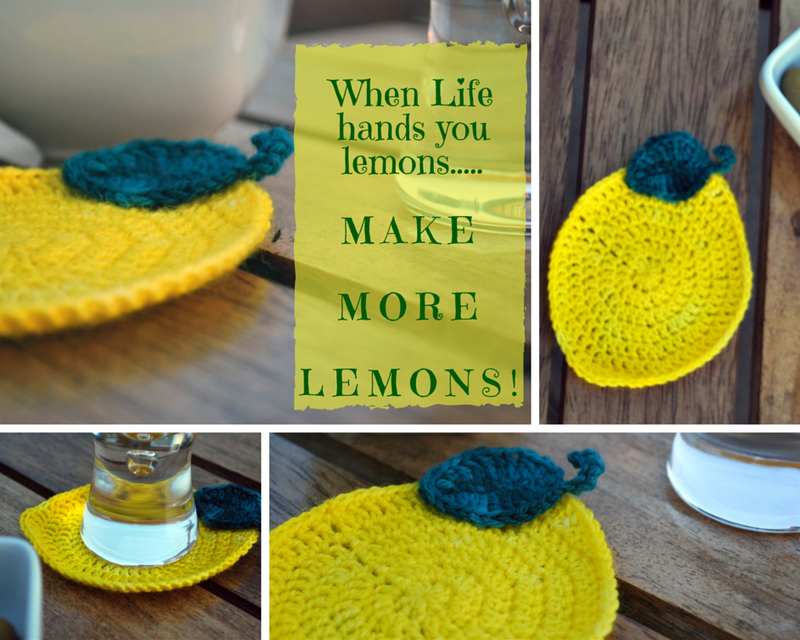 When life hands you lemons….crochet lemon coasters! What am I going to do with all these lemons? 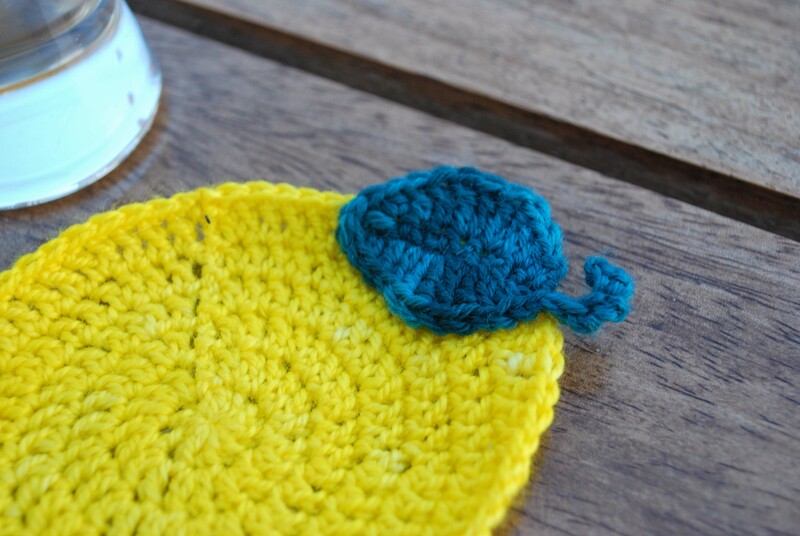 Why, use them for inspiration, make a lovely coaster for a cool drink and share the pattern with you! No tutorial this time, as the light is fading (so is the cool drink!) but if anyone has any questions, I’d be happy to help. 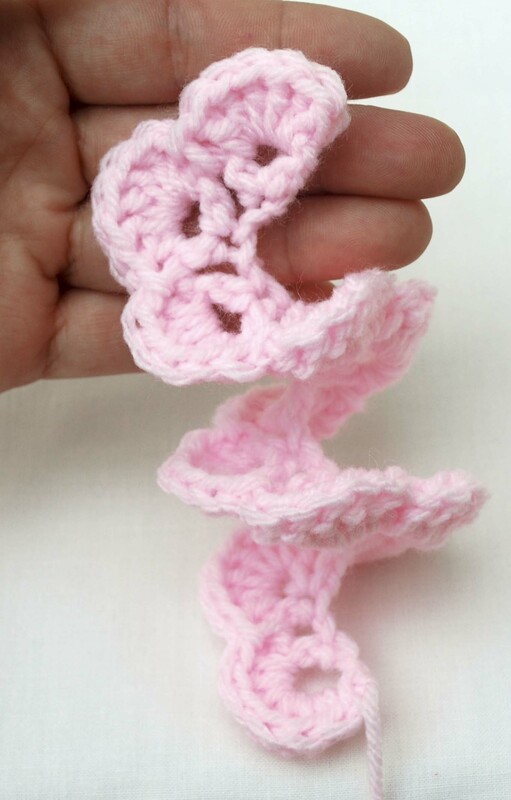 If you are unfamiliar with the magic loop technique, Craftsy have a great tutorial here. 1ch, 19dc, *2htr, 2tr, 1dtr, 3dtr in next st, 1dtr, 2tr, 2htr, 19dc*, rep from * to *, sl st to first dc to join. Using the green yarn and 2.75mm hook, chain 11 sts. Work 1dc in second ch from hook and in each ch across. Turn, work 2dc, 1htr, 1tr, 2dtr in each of next 2 sts, 1tr, 1htr, 2dc. With the front of the leaf still facing you, turn it 180 degrees and rep Row 2, working into the bottom of the chain (the underside of the dc previously worked). Sl st into the top of the leaf, ch6, turn and (starting in the second ch from the hook) work 1dc into each ch back down towards the leaf. The reason for adding the stalk at the end is so that it doesn’t twist whilst working the leaf. Weave in all ends, sew the leaf into desired position. What do you like to make when life hands you lemons? 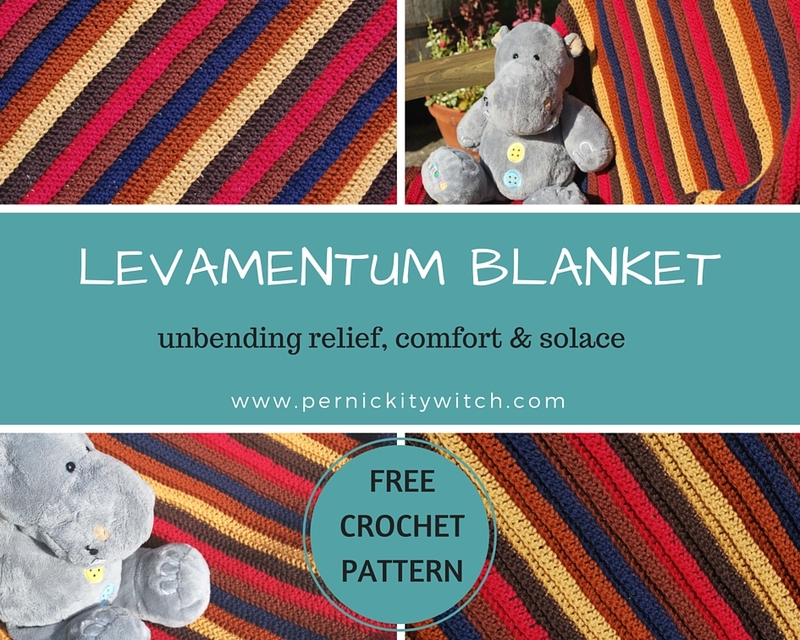 Don’t forget to follow if you want more fab free patterns delivered direct to your inbox. 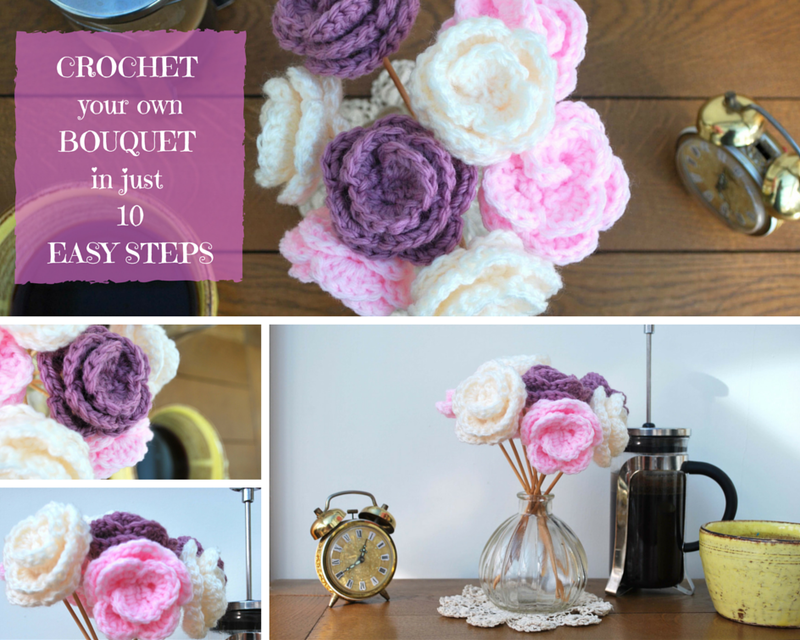 Easy crochet flower bouquet – free pattern! 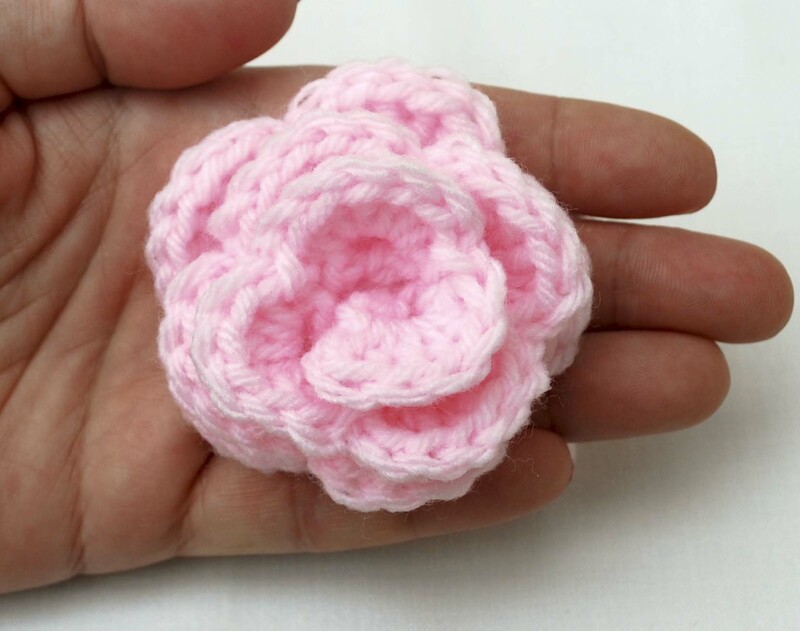 FREE CROCHET PATTERN for little flowers below. WARNING: they may be addictive! 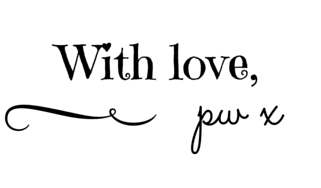 and I thought I’d share it with you. I used Aran yarn and a 5mm crochet hook. Other tools you may need are a tapestry needle, some reed diffuser sticks (or kebab sticks) plus a small vase and some superglue. 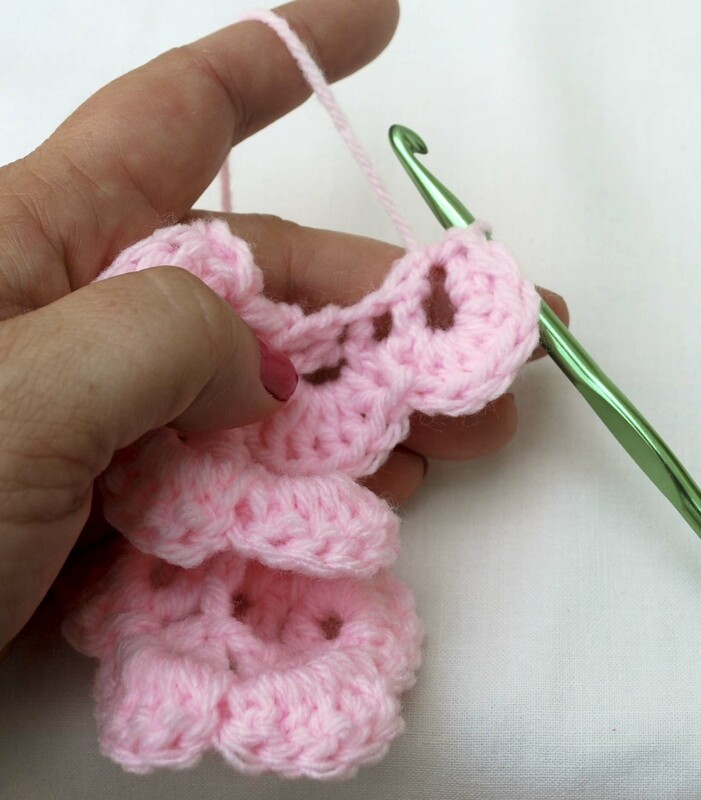 Using the 5mm hook, make a slip stitch and work 27 chains. Work a treble into the 5th chain from the hook. This counts as 1tr, 1ch, 1tr – first V stitch made. Miss 1 chain, work (1tr, 1ch, 1tr) in next chain. One ‘V’ worked. Repeat Step 3, working treble ‘V’s in every other chain across, ending with a V in the final chain. Your fabric will naturally curl. Turn, and work 6 trebles into the chain space of the first ‘V’ to create the first ‘petal’. No turning chain is needed. 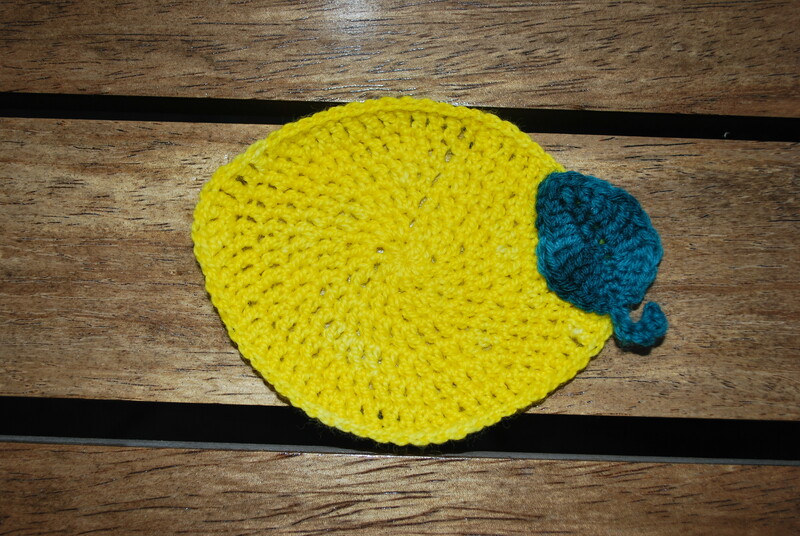 Fix the first ‘petal’ in place by working a slip stitch into the gap (not a chain space) before the next V stitch. Work 6 tr into the next V stitch, followed by a sl st into the gap, across the row. Finish the last petal by working a sl st into the same chain space as the last 6 tr. This gives the last petal a lovely shape too. 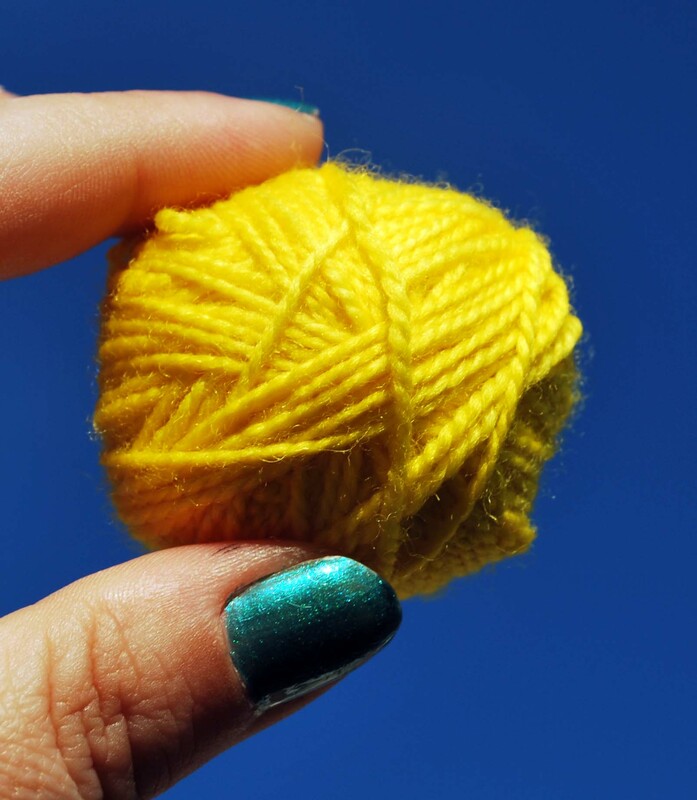 Your fabric should now look something like this – see how it’s all nice and curly? It’s desperately trying to become the flower! 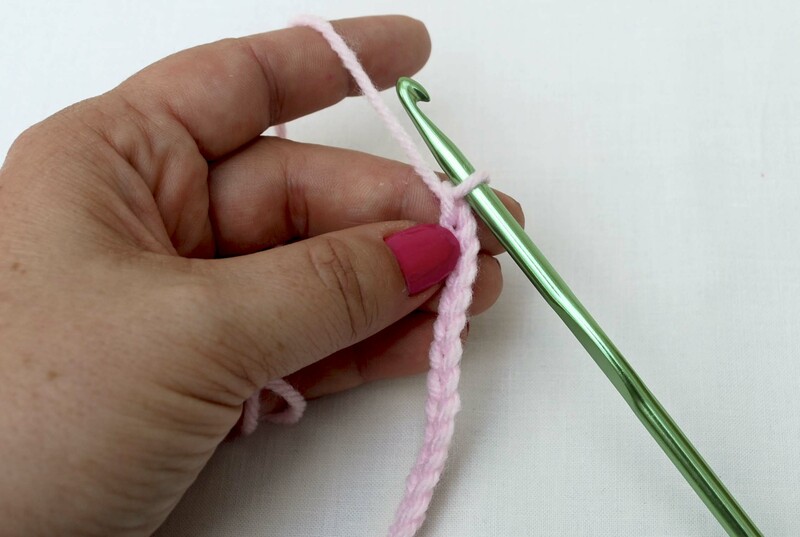 All you need to do it coax it a little more into shape, then sew it in place (and weave in ends at the same time) with the tapestry needle. Take the Reed Diffuser sticks (or wooden kebab skewers) and dab the ends with a little glue. Attach them to the back of the flowers and set aside to dry. Arrange nicely in the diffuser or vase, step back and admire! 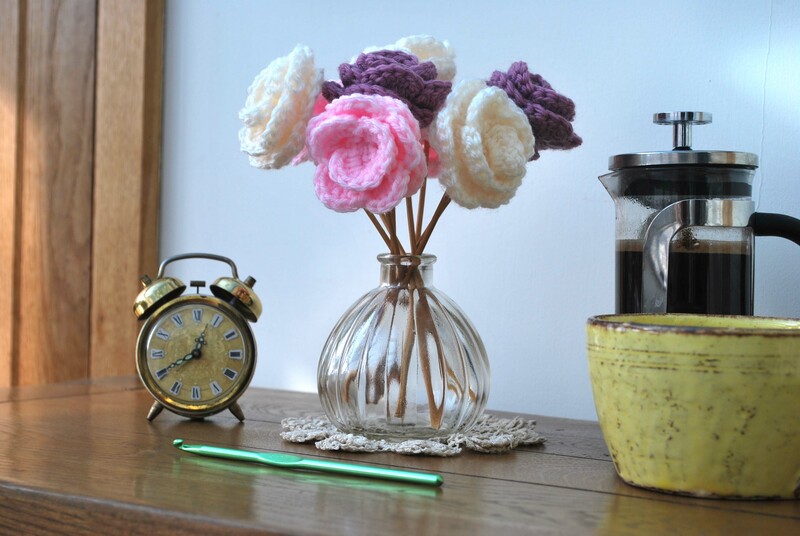 These simple crochet flowers are ideal for so many projects – brooches, hair accessories, make them in sock yarn and fix to ice-cream sticks to use as bookmarks, sew lots together for a really fun scarf. 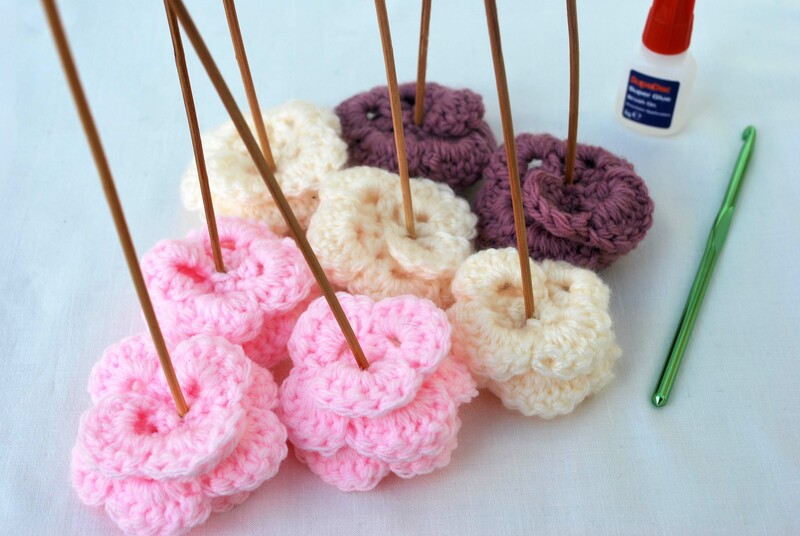 What would you do with these oh-so-cute and easy to crochet flowers? 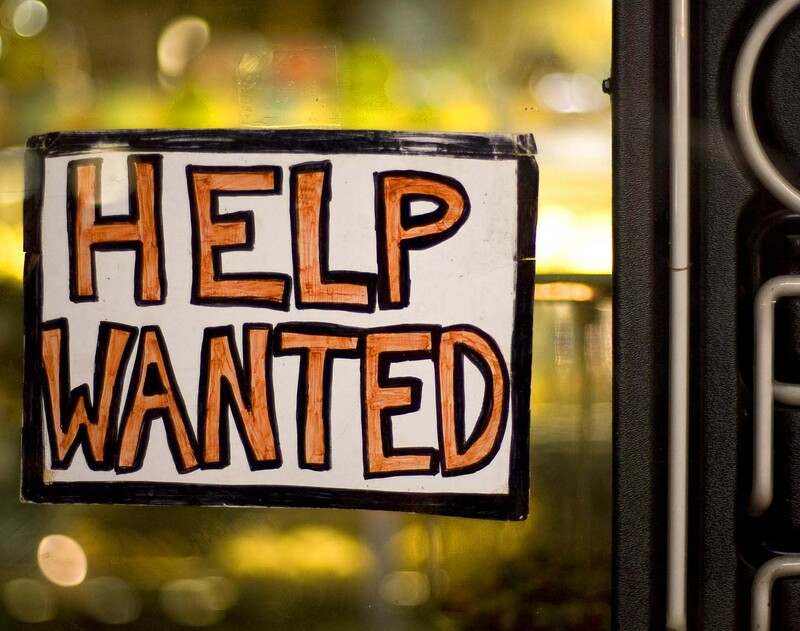 Leave me a comment or share your projects!